For the second bit of my holiday, I went to Maui and basically spent nine days with the theme tune from Hawaii Five-0 in my head. I hadn’t quite appreciated how far from anything Hawaii actually is. It’s a five and a half hour flight from Sacramento, 11 hours from Brisbane, 20 hours from London and nearly slap bang on the international dateline. Consequently, there were loads of Americans there, nearly as many Australians and no British people at all when we visited. We spent the holiday being mistaken for Australians, which isn’t nearly as uncommon as you might imagine, especially with a London accent. A bit of research suggested the best time to visit is during Hawaii’s dry season (April to October), though as it’s tropical, it’s likely that you’ll get rain at some point somewhere. Temperatures were around the 35-39 degrees mark which was apparently exceptionally hot while we were there because the trade winds hadn’t arrived but it’s usually more like 25-29 degrees. Landing at Kahului airport, we found it was just as hot as California, except where the latter was dry, Hawaii is humid. Very humid. 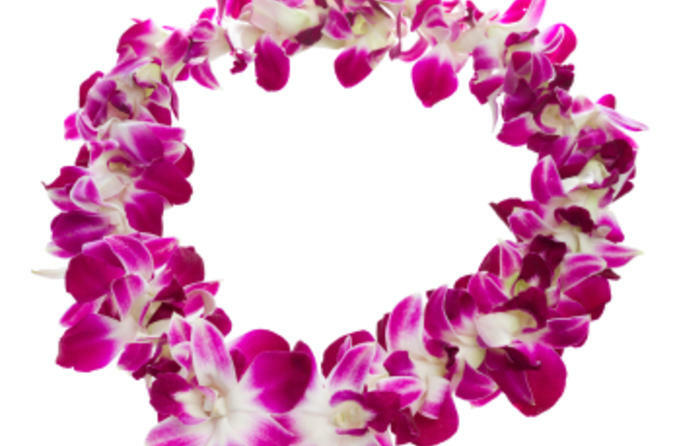 Our Californian hosts had decided that we were going to get a traditional welcome, which in this case is a fresh flower lei, a lot like this one. They’re rather pretty and smell gorgeous so we kept them in our room for a few days until they started to wilt. Our hotel was also giving out shell necklaces to arriving guests, which a number of people (mainly men, it has to be said) seemed to believe transformed them from an overweight and balding middle manager from Iowa or wherever into a ripped surf dude. We saw shell necklaces looped around wrists, ankles, necks and in one case, balanced on a head like a tiara. Maui appears to be an island of two halves – while both sides are overshadowed by mountains, one is lush with jungle-like vegetation and the other more arid. The road from the airport was a coastal one, with panoramic views across the sea and when we arrived, partially lined with battered trucks. Their owners were out surfing in the bay. Surfing is, of course, one of the main reasons people visit Hawaii. I know zilch about surfing apart from random phrases from the film Point Break, but we saw a lot of people standing on boards paddling along. Apparently, stand-up paddle boarding is popular in areas where there’s no wind and smaller waves. It’ll also come as no surprise that tourism is Hawaii’s number one industry, making Maui alone worth more than £3.5bn in the last few years. Something you might want to know about Hawaii before we go much further is that it can be eye-wateringly expensive. We found a meal for two with a bottle of wine in a reasonable restaurant came to around $120 plus service (so about £85). This is partly because something like 85% of their food is imported, but also the islands’ popularity as a tourist destination for wealthy nations. The service is super friendly in typical American fashion. So what can you do there? Well, on Maui three of the big tourist attractions are the Hāna Highway, Haleakalā National Park and Lahaina. We decided to take in the first two on a day trip. The road to Hāna is astonishing. A 60 mile route connecting Kahului with the town of Hāna, one minute there’s a vertiginous drop off a cliff on one side and a waterfall on the other, then the next you’re driving through a tiny winding road under a canopy of greenery. You can’t go more than about 15mph on any of it and in some bits you’re literally crawling along at 5mph, so it’s not a trip for the impatient. The roads are narrow, badly-sighted and frequently single-track, yet thousands of tourists drive them every day in a shimmering snake of metal that edges through the rainforest. It took us about three hours to drive to Hāna and then you turn around and go back again. Why? The road beyond the town is unpaved and rental car companies stipulate when you pick up your car at the airport that you can’t go on it. Given we’d hired a Dodge Challenger, we didn’t fancy putting its suspension to the test. Driving past one of the route’s many stopping places, we caught a glimpse of primary-coloured plumage. A man had set up station in the layby with a brace of parrots. I’m still not entirely sure it was legitimate – he claimed to be raising money for a nearby bird sanctuary and the parrots had been trained for films. But the way he flung them around, piling them onto the heads of shrieking tourists and shuffling them like playing cards was a bit unsettling. Despite our misgivings, they were beautiful. On our way back from Hāna, we visited our second tourist destination of the day – the Haleakalā National Park. Haleakalā is an extinct volcano and we’d been told by a number of people that we should drive up there for sunset. So we did. I will say right here that it’s one of the most breathtaking sights I’ve ever seen and that my stock of superlatives is going to run out pretty quickly. The photo at the top of this post was taken more than 10,000 feet up as the sun sunk below the clouds. It was still light when we got up there, so there weren’t that many people around. The silence as you look down through drifting clouds on craters formed millions of years ago is profound. The air is cold and clean and it’s just fabulous. As the sun starts to go down, more people turn up, and unlike us, they were prepared. We had a shop owner in Kaanapali Beach to thank for the fact we weren’t totally unprepared. At more than 10,000 feet, it’s cold. We had jumpers, but the better-prepared had flasks of coffee, blankets, deckchairs and picnics. The best place to watch was from just below the observatory, a very short climb above the car park. First the sky turned a sulphuric yellow, then darkened into a flaming red-orange, the glow spreading out across the clouds. Seriously, if you do nothing else in Maui apart from lie on the beach and mainline Mai Tais, you must visit Haleakalā at sunset. One of the other things you’re meant to do in Hawaii is go to a luau, which is basically a traditional dinner and entertainment. Not long after we arrived, we spent the day sitting by the pool and drank far too many Mai Tais before falling asleep drunk and subdued by heat in our room. By good fortune, our room looked out directly over the area where the hotel’s twice-weekly luau was held, so we watched it from the comfort of our own balcony with room service dinner. Which brings us neatly on to Lahaina. Home to the famous banyan – another big tree and the largest of its type in the US – Lahaina is a bit like a cross between Whitstable and Brighton.The town hosts a huge number of tut shops, restaurants and shops along the lines of Billabong. It’s very pretty. We had dinner at Kimo’s which was ferociously busy, but a harassed yet charming waiter managed to seat us on the terrace. It shouldn’t come as a surprise, but all the fish and seafood dishes we ate in Hawaii were delicious and Kimo’s was no exception. I had coconut prawns with honey mustard dip and lobster-topped grilled fish and the other half went for seared ahi tuna. It was dark when we went, but we were told the view over the harbour is lovely during the day. Again, it ain’t cheap, but when the food is that good it’s hard to care too much. Another day, another volcano, this time an active one. Kilauea on the island of Hawaii (known as the Big Island – we flew into Hilo) made the news recently. It’s been erupting since 1983 and when you think of a volcano erupting, you think of fountains of lava spewing upwards from a crater-topped mountain. Not Kilauea. Its lava has been mostly flowing through underground tubes which deposited their red-hot contents safely into the sea (barring miles of charred destruction around the actual crater). Then something changed and the lava began flowing towards the village of Pahoa. The unlucky villagers were evacuated as the lava made its way towards them at a rate of about 900 feet per day. In case you were wondering, the evacuees don’t get compensation. We were told that property is very cheap in the area but you pays your money and you makes your choice. Surprisingly, there are helicopter tours which will take visitors up and fly them around the crater while pointing out blackened landmarks. We went with Blue Hawaiian Helicopters at $200 each for an hour’s tour. Hawaii is obviously a completely different island to Maui, so you have to drive back to Kahului airport, queue for security and get on a plane. In my head I thought that island-hopping around Hawaii was going to be a case of jumping on a tiny plane and spending 30 minutes zipping off. It’s not that easy and it’s not that cheap. We paid just over $100 each for the inter-island flight – it’s not hard to see all the costs adding up. The thing is, you come all this way and there is stuff to see which you are probably never going to see again in your life. Like an erupting volcano from a helicopter. As the helicopter took off, there was a familar roll of drums played through our headsets. Hawaii 5-0! Scott, the pilot, must have had a sense of humour because we also got Ride of the Valkyries from the helicopter scene in Apocalypse Now. The tour was excellent, though it would have been nice to be up for longer. It’s hard to describe the devastation around Kilauea. It’s just miles and miles of gently smoking charred crust. What trees are left are just skeletons and in places you can see actual lava running underneath the crust. What you see is new land forming. Every now and again, you can see a tree in flames as the lava creeps (I say creeps – it moves at 900 feet per day) further out. Once we’d had our fill of lava, so to speak, we headed back towards the coast to look at waterfalls. Yes, the tour is expensive, but your value for money is very good. The pilot was knowledgeable about the local area, made sure we had plenty of opportunity to take pictures and answered all our stupid questions. The final trip of the holiday was to Pearl Harbor. Having only seen the crap eponymous film, I didn’t actually have much background knowledge of one of the biggest attacks in World War II. Visiting Pearl Harbor (I have to keep stopping myself spelling it with a ‘u’) involved another island-hop to Oahu. This time it was a bit more like I imagined it. Kapalua Airport is a tiny airfield which was just a few minutes from our hotel. With just six other tourists, we flew over yet more astonishing scenery, including the tallest sea cliffs in the world and a great view of the cockpit. It’s about a 40 minute flight from Kapalua to Oahu and cost about $120 each. The plane is so tiny that the airline weigh you at check in though at least the display is pointed away from other passengers. Because I know pretty much nothing about types of planes, I can’t say what it was, but there’s a picture of it here so the plane-spotters among you can work it out for yourselves. We were picked up at the airport by a cheery guy in a coach and transported to Pearl Harbor. There are lots of different tours you can do – we were restricted by flight times back to Maui so opted for a trip just to the harbor and the USS Missouri. If you really wanted to, you could also fly around the island in a helicopter, visit the cultural centre and more waterfalls. Security, for obvious reasons, is pretty tight at Pearl Harbor. You can’t take bags so everything has to be carried in your pockets. It’s a bit aggravating but there is a cloakroom just outside the centre where you can leave bags and jackets for $3. So, a bit of history. By 1939, the Japanese were taking over quite a bit of the south Pacific. They’d invaded China and by the middle of 194l, had occupied French Indochina and were starting to eye up Thailand, the Philippines and Burma. Not altogether surprisingly, this alarmed the US, Netherlands and the UK into using economic and trade sanctions to try and curb Japan’s ambitions. Although the US had a major base for the Pacific fleet at Pearl Harbor, a lot bit of complacency meant many of the US armed forces were committed elsewhere and they didn’t believe Japan had the capability to take them on. Basically, they were completely unprepared for the surprise attack. On the morning of 7 December 1941, a radar station on Oahu spotted the Japanese planes coming their way but decided to ignore it, believing them to be US planes returning from California. Sadly, it was an error which cost the lives of more than 2,400 people and injured 1,170 others. The attack also sank eight battleships (five of which were later repaired and returned to service), including the USS Arizona, which was left as a memorial, and damaged 10 other craft. On arrival at Pearl Harbor visitors’ centre, the best thing to do is visit the cinema for a short film about the attack. If, like me, you’re hopelessly ignorant about World War II, it’s really useful for explaining the political situation which led to the attack along with the key players and timelines. A word to the wise – they insist you don’t use mobile phones in the cinema so if you’re one of those annoying people who can’t go for longer than five minutes without checking your phone, try to resist. I’m pretty certain they wouldn’t actually shoot you but they might fix you with a glare of disapproval and it IS kind of dickish to get distracted by Facebook while watching footage of injured men in seas of burning fuel during a war. There’s a boat which takes visitors across to the Arizona memorial. Our tour guide suggested we sit on the left hand side so we could get decent photos of the memorial which turned out to be a good tip. The memorial itself is above where the battleship was sunk and looking down through the clear water you can see the ship rusting away, a watery grave for 1,177 servicemen. The USS Missouri is a short bus ride away. We didn’t get a lot of time on it, but in all honesty, unless you’re very interested in naval history you wouldn’t want to spend a long time there. If you do visit, beware – there’s a very long talk at the start which has visitors standing on the deck in full sunlight for quite a long time so water and a hat come in useful. One bit of trivia I took away with me from the Missouri tour guide was that when the ship was being decommissioned, a number of US states expressed an interest in re-homing it. One of the contenders was the state of Missouri, which is inland so could have raised some interesting questions about transportation. I guess you can’t Fed-Ex a battleship. I have no idea if this is actually true but I would like it to be. Another bit of trivia I got from visiting Hawaii is that the name of the 70s TV show refers to the fact that Hawaii is the 50th state of the US. Hawaii is one of the most beautiful places I’ve ever been to. The scenery is just stunning and unlike a lot of beach holidays, it would be pretty easy to see and do something different every day. Nine days was not long enough. See more Hawaii photos here.